The Nuclear Renaissance is Over in the U.S. The nuclear renaissance seemed to offer a path forward to deploy new generations of safer, more efficient power reactors to replace existing fleets of large power reactors. In the U.S., that transition is captured in the following diagram. The current issues plaguing the U.S. nuclear power industry are largely financial, driven primarily by the low price of natural gas and the correspondingly low price of electricity generated by fossil power plants fueled by natural gas. The recently implemented EPA Clean Power Plan (CPP) also is having an impact by failing to give appropriate credit to nuclear power plants as a means for minimizing greenhouse gas (GHG) emissions. This leaves renewable power generators (primarily hydro, wind and solar) to meet GHG emission targets in state and utility electric power portfolios. See my 27 November 2015, 8 July 2015 and 2 July 2015 posts for more information on the CPP. Successfully operating nuclear power plants are being retired early for financial reasons. Fewer large, new Generation III (Gen III) advanced light water reactor plants are being built than expected. The prospects for small, modular reactors (SMRs) and advanced Generation IV (Gen IV) reactors will not be realized for a long time. Important infrastructure facilities in the U.S. commercial reactor fuel cycle have been cancelled. These issues are discussed in the following text. In a merchant energy market, nuclear power plants, even those operating at very high capacity factors, are undercut by natural gas generators, which can deliver electricity to market at lower prices. 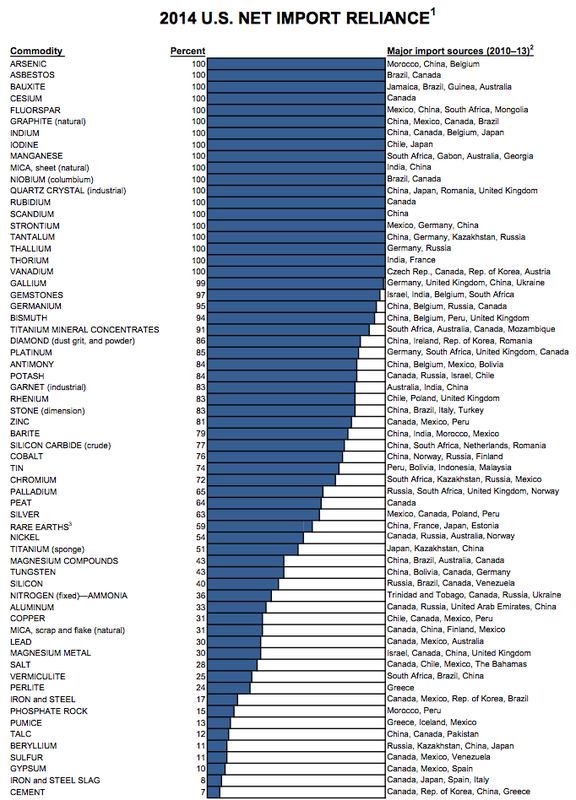 During the period from 2013 to 2015, the U.S. fleet of 99 power reactors (all considered to be “Generation II”) operated at an average net capacity factor of 90.41% (net capacity factor = actual power delivered / design electrical rating). This fleet of reactors has a combined generating capacity of about 100 GW, which represents about 20% of the total U.S. generating capacity. Nuclear power plants do not currently receive subsidies commonly given to solar and wind power generators. For many U.S. utility executives, nuclear power plants are becoming financial liabilities in their generating portfolios. While some states are discussing ways to deliver financial relief for nuclear power plants operating within their borders, other states appear willing to let the plants close in spite of their real contributions to GHG reduction, grid stability, and the state and local economy. 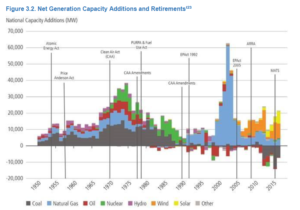 Following are several examples of nuclear plant early retirements. On 2 June 2016, Exelon announced plans to retire the Clinton and Quad Cities nuclear plants on 1 June 2017 and 1 June 2018, respectively. This action was taken after the state failed to pass comprehensive energy legislation that would have offered financial relief to the utility. Also, Quad Cities was not selected in a reserve capacity auction that would have provided some needed future revenue. If the plants are closed as currently scheduled, Exelon will walk away from about 33 GW-years of carbon-free electric power generation. 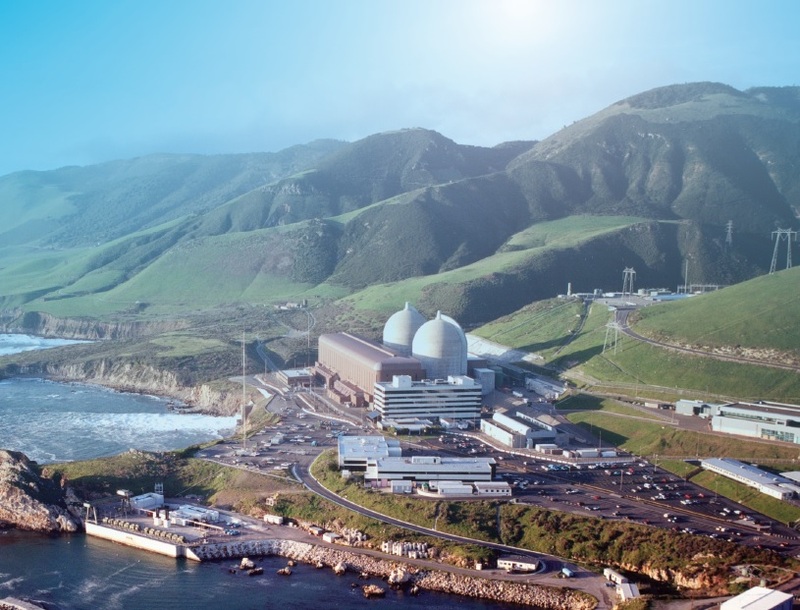 On 21 June 2016, PGE issued a press release announcing that they will withdraw their application to the NRC for a 20-year license extension for the Diablo Canyon 1 & 2 nuclear power plants and will close these plants by 2025 when their current operating licenses expire. PGE will walk away from about 41 GW-years of carbon-free electric power generation. With a net output of about 476 MWe, Fort Calhoun is the smallest power reactor operating in the U.S. In 2006, the Fort Calhoun operating license was extended to 2033. This plant operates as part of a power cooperative and is not subject to the same market forces as merchant plants. Nonetheless, the price of electricity delivered to customers is still an important factor. On 16 June 2016, the OPPD Board announced their decision to close Fort Calhoun by the end of 2016 and stated that the closure was based simply on economic factors: it was much cheaper to buy electricity on the wholesale market than to continue operating Fort Calhoun. It cost OPPD about $71 per megawatt-hour in 2015 to generate power at Fort Calhoun. This is double the national industry average of $35.50 and much more than the open market price of about $20 per megawatt-hour. Sustained low current and long-term wholesale energy prices, driven by record low natural gas prices due to the plant’s proximity to the Marcellus shale formation, have reduced the plant’s revenues. The plant carries a high cost structure because it is a single unit. 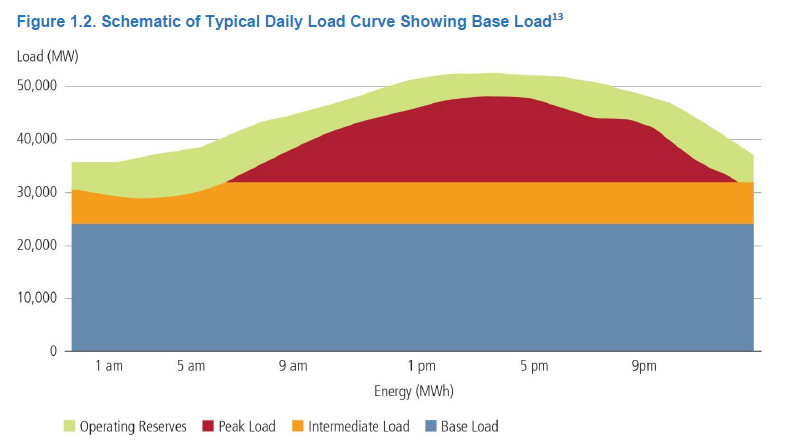 The region has excess power supply and low demand. No doubt this approach to establishing zero-emissions credits for nuclear power plants will be closely watched by other states that are faced with this same issue of nuclear power plant early retirement for economic reasons. Hopefully, Entergy will reconsider its planned closure of the James A. FitzPatrick nuclear power plant. Recent actions are highlighted below. The NRC confirmed that, effective 21 June 2016, Entergy had withdrawn its application for a COL for a single unit of the General Electric Economic Simplified Boiling Water Reactor (ESBWR) at the River Bend site in Louisiana. This is the end of a series of delays initiated by Entergy. On 9 June 2009, Entergy requested that the NRC temporarily suspend the COL application review, including any supporting reviews by external agencies, until further notice. The NRC granted this suspension. On 4 December 2015, Entergy Operations, Inc., filed to have their COL application withdrawn. 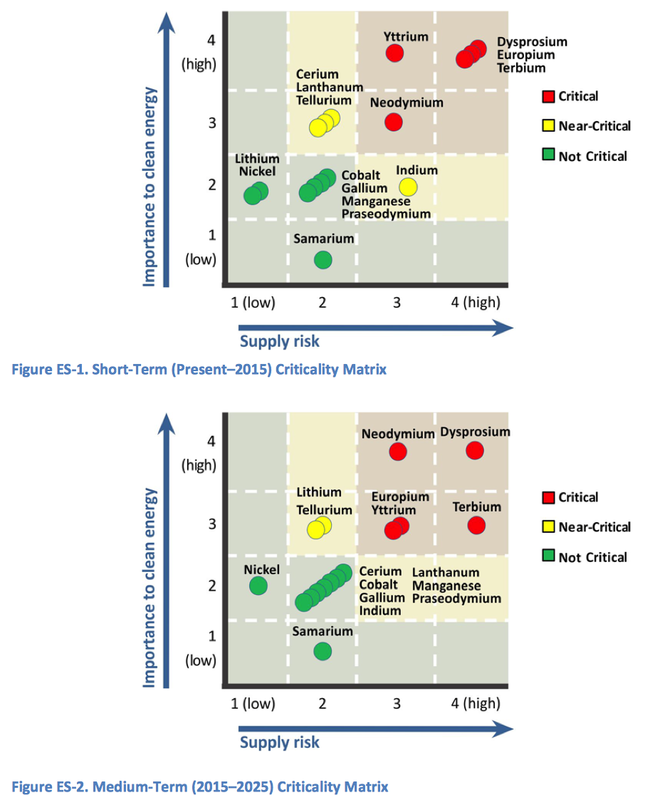 2.2 Three of the seven approved Gen III plants may never be built: Fermi-3 and STP 3 & 4. Fermi 3: On 7 May 2015, NRC announced that the Fermi-3 COL had been issued. After the COL was issued, DTE Energy is reported to have said it has no immediate plans to build Fermi 3, and sought the approval as a long-term planning option. If built, Fermi 3 will be a GE-Hitachi ESBWR. South Texas Project (STP) 3 & 4: In April 2015, NRG shelved plans to finance STP 3 & 4. NRG spokesman David Knox said, “The economics of new nuclear just don’t permit the construction of those units today.” Nonetheless, NRG continued the NRC review process and NRC issued the COLs for STP Units 3 and 4 on 12 February 2016. If built, STP 3 & 4 will be Toshiba Advanced Boiling Water Reactors (ABWRs). 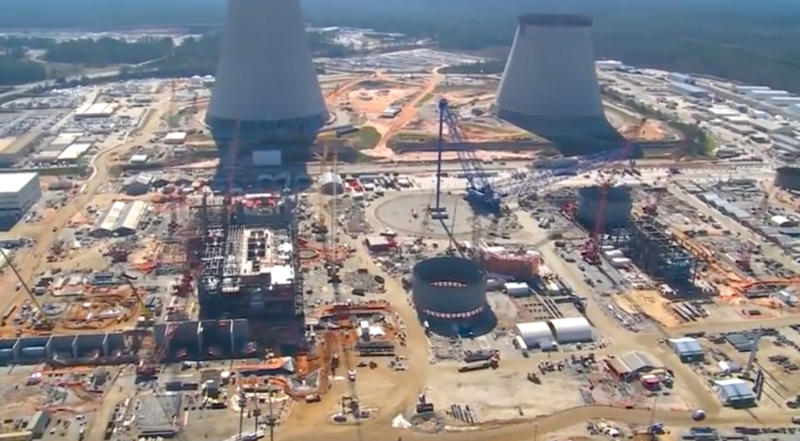 2.3 Only four of the seven approved Gen III plants are actually under construction: V. C. Summer 2 & 3, and Vogtle 3 & 4. So far, the net results of the nuclear renaissance in the U.S. are these four new Gen III plants, plus the resurrected Watts Bar 2 Gen II nuclear plant (construction stopped in 1980; not completed and operational until 2015). C. Summer 2 & 3: Both units are under construction. 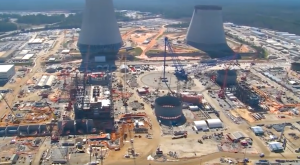 These are Westinghouse AP-1000 PWR plants. In February 2016, South Carolina Electric and Gas Co. (SCE&G) reported that 85% of the major equipment necessary to build Units 2 and 3 was onsite. Most of the remaining equipment has been manufactured and was awaiting transport to the site. 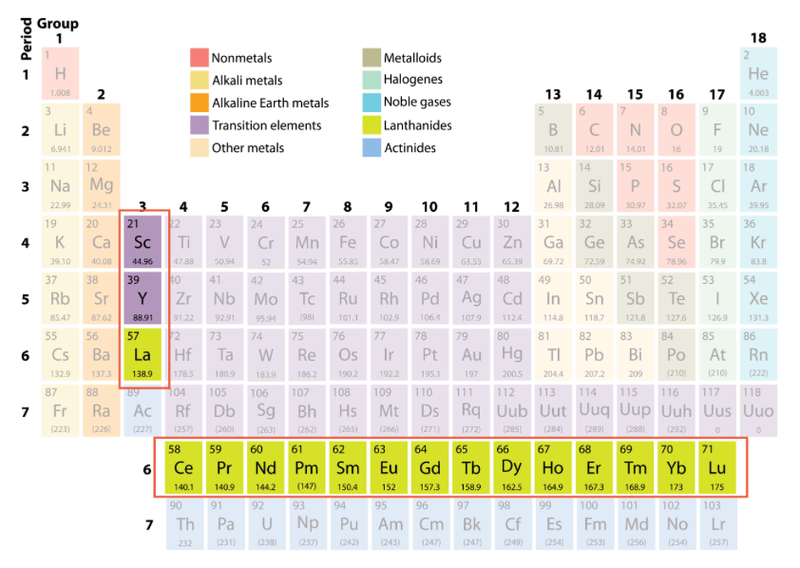 Currently there are no SMRs or Gen IV reactors in any stage of a licensing process that could lead to a generic design certification or a combined license (COL) for a specific plant. 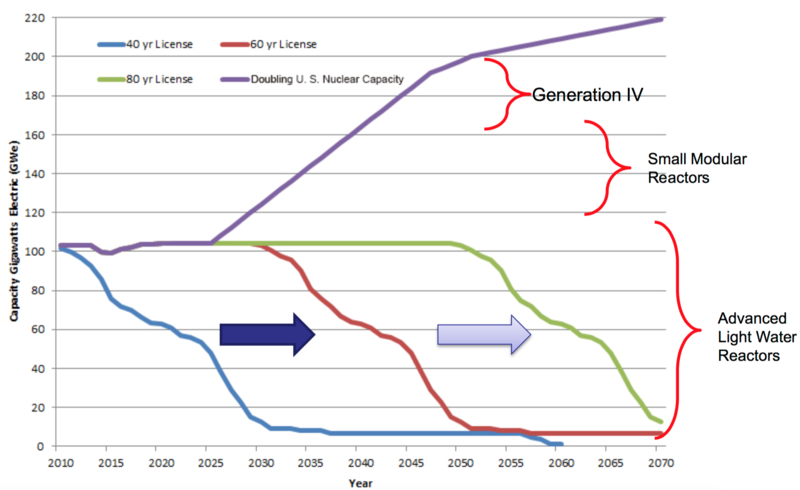 The DOE presentation by John E. Kelly entitled, “Vision and Strategy for the Development and Deployment of Advanced Reactors,” includes the following timeline that shows projected U.S. nuclear generating capacity for four scenarios. The declining blue, brown and green curves show the generating capacity available from the existing fleet of power reactors depending on the length of their operating licenses (40, 60, or 80 years), and of course, assuming that there are few early plant closures for economic reasons. 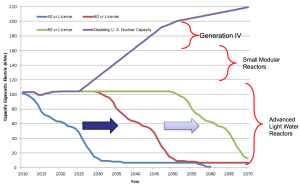 The upper purple line represents total nuclear generating capacity needed to maintain nuclear at about 20% of the total U.S. generating capacity. Significant growth in demand is expected due to electrification of transportation and other factors, creating a demand for 200 GW of nuclear generated electricity by about 2050. This is double the current U.S. nuclear generating capacity!! Among all the presentations in the 2016 workshop, there is no mention of where the capital comes from to build all of the new nuclear power plants needed to meet the expectation of 200 GW of nuclear generating capacity by 2050. If the expected economic advantages of SMRs and Gen IV plants fail to materialize, then construction cost per gigawatt of electrical generating capacity could be similar to current Gen III construction costs, which are on the order of $5 to 6 billion per gigawatt. This puts a price tag of $1.0 to 1.2 trillion on the deployment of 200 GW of new nuclear generating capacity. The actual amount isn’t particularly important. Just be aware that it’s a very big number. This leads me to believe that the above timeline is quite optimistic. There was considerable optimism when the mPower program was launched more than a decade ago. 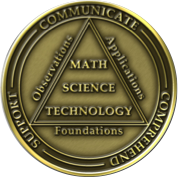 This program probably is further along in its design and development processes than other U.S. SMR candidates. Unfortunately, mPower has been in decline for the past two years, during which time the mPower team head count fell from about 600 to less than 200 people. That reduction in force and slowdown in development occurred after the B&W board of directors (parent of BWXT) decided to reduce spending on mPower from about $100 million per year to a maximum of $15 million per year. The official explanation was that the company had failed in its effort to find additional major investors to participate in the project. On 13 May 2016, Tennessee Valley Authority (TVA) applied to the NRC for an early site permit for SMRs at the Clinch River site in Tennessee. In its application, TVA did not specify the reactor type, but previously had considered mPower for that site. The NRC is expected to decide in July 2016 if the application contains sufficient information to start the early site permit review process. None have submitted an application for design certification to the NRC. Gen IV reactors are intended to be the next generation of commercial power reactors, incorporating a variety of advanced technologies to deliver improved safety, reliability and economics. In this GIF presentation, you can see the significant schedule slip that has occurred between their 2002 and the 2013 roadmaps. 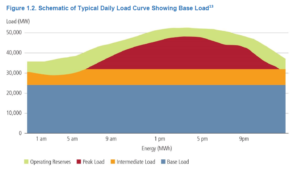 At the slow rate that DOE and its international GIF partners are actually making progress, I suspect that there will not even be a working Gen IV demonstration plant of any type before 2030, and certainly none in the U.S.
Nuclear power plants are part of a fuel cycle, which for the U.S. has been a once-through (“throw-away”) fuel cycle since President Carter’s 7 April 1977 decision to discontinue work on a closed fuel cycle with nuclear fuel reprocessing. 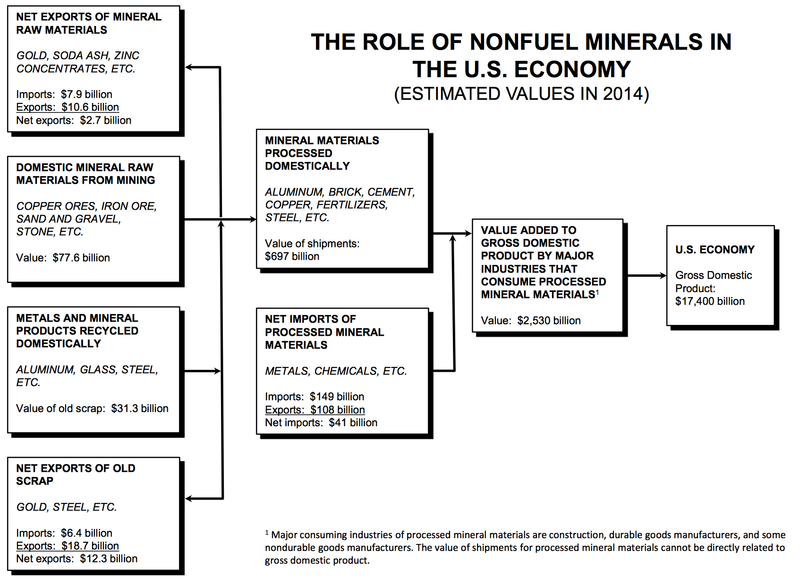 “Head-end” fuel cycle facilities include mining, milling, conversion, enrichment, and fuel manufacturing. 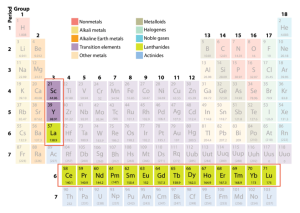 These are the facilities that take uranium and/or plutonium from various sources and produce the desired nuclear fuel that is incorporated into the fuel elements that ultimately are installed in a reactor. “Back-end” fuel cycle facilities deal with the spent fuel elements and nuclear waste generated from reactor operation and other fuel cycle activities. In the once-through fuel cycle, the spent fuel is stored at the nuclear reactor where it was used until it can be transported to a nuclear waste repository for final disposition. Two important nuclear fuel cycle facilities have been cancelled by the Obama administration: the Yucca Mountain Nuclear Waste Repository and the Savannah River Mixed-oxide Fuel Fabrication Facility. These cancellations have the effect of adding cost and uncertainty for the utilities operating commercial power reactors. 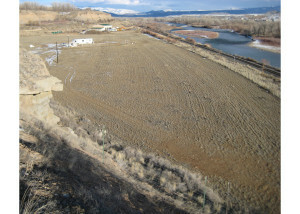 As is well known by now, the DOE abrogated its responsibility to develop a deep geologic site as the national commercial nuclear waste repository. Congress established this DOE role in the Nuclear Waste Policy Act of 1982. Yucca Mountain in Nevada was designated as the national repository site in the Nuclear Waste Policy Act amendments of 1987. Congress approved the Yucca Mountain project in 2002, and the project was docketed for licensing by the NRC in 2008, as Docket 63-001. 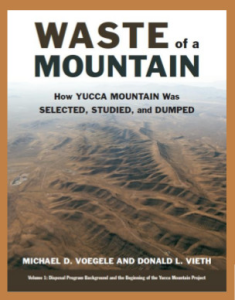 Yucca Mountain effectively was terminated in 2011 when the Obama administration removed funding for the project from the DOE budget. The NRC licensing process was suspended at the same time. NRC staff finds that DOE’s application meets most, but not all, of the applicable NRC regulatory requirements. Requirements not met are related to certain conditions of land ownership and water rights. 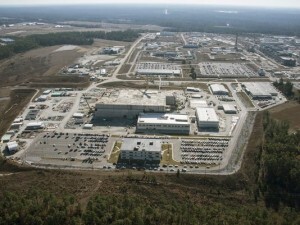 NRC staff therefore does not recommend issuance of a construction authorization at this time. In this presentation, the author, James Rubenstone, identifies licensing actions still to be completed for the Yucca Mountain site and notes that, “Further progress of the review and licensing activities requires further appropriations.” In March 2015, the NRC reported that completing its Yucca Mountain licensing process would cost an additional $330 million. On 5 May 2016, the NRC issued the final Environmental Impact Statement (EIS) supplement for Yucca Mountain. This is not the end of the EIS process. 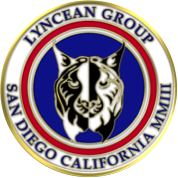 There still remain about 300 contentions against the project that must be adjudicated. However, the adjudicatory process remains suspended. So the bottom line is simply that this nation is very far, probably several decades, from having a national repository for commercial nuclear waste and spent nuclear fuel. 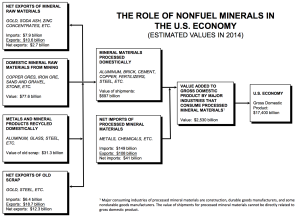 The burden for managing spent nuclear fuel remains with the U.S. nuclear utilities, which had been paying DOE for decades to develop the national nuclear waste repository. 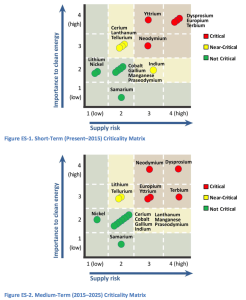 The current utility approach involves on-site management of spent fuel, initially in the spent fuel storage pool, and later in dry storage in canisters or casks that provide radiation shielding and protect the spent fuel from external hazards. These dry storage facilities typically are called Independent Spent Fuel Storage Installations (ISFSI). Nuclear utilities have added ISFSIs specifically to cope with the failure of DOE to complete the national nuclear waste repository as required by Nuclear Waste Policy Act of 1982. Final termination is scheduled to be complete in fiscal year 2019. The nuclear renaissance is over in the U.S. The expected long-term availability of low-price natural gas makes it difficult or impossible for nuclear power plants to generate electricity at a competitive price. 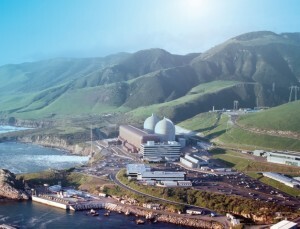 A future nuclear renaissance could be enabled if many states in this nation take the bold steps proposed by the New York Public Services Commission (PSC) to recognize the importance of nuclear power in the state’s generation portfolio and provide adequate financial incentives to nuclear utilities so they can operate profitably, extend the lives of existing nuclear plants, and build new nuclear plants. 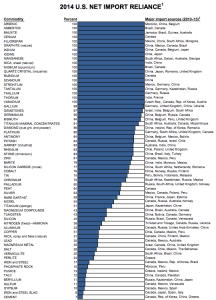 The TOP500 list ranks computers by their performance on a LINPAC Benchmark test to solve a dense system of linear equations. 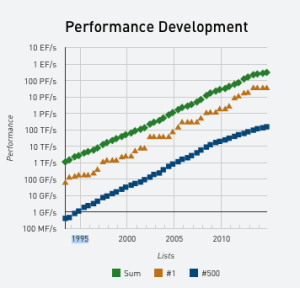 While this performance metric does not reflect overall performance of a given system, the systematic application of this benchmark test provides a good measure of peak performance and enables a meaningful relative ranking. Intel will work with Cray Inc. as the Aurora system integrator sub-contracted to provide its scalable system expertise together with its proven supercomputing technology and the HPC (Hewlett Packard) software stack. Aurora will be based on a next-generation Cray supercomputer, code-named “Shasta,” a follow-on to the Cray® XC™ series. Aurora is expected to have a peak performance of 180 petaflop/s. When commissioned in 2018, this supercomputer will be open to all scientific users. Argonne and Intel will also provide an interim system, called Theta, to be delivered in 2016, which will help ALCF users transition their applications to the new technology to be used in Aurora. DOE earlier announced a $325 million investment to build new, state-of-the-art supercomputers at its Oak Ridge and Lawrence Livermore laboratories.